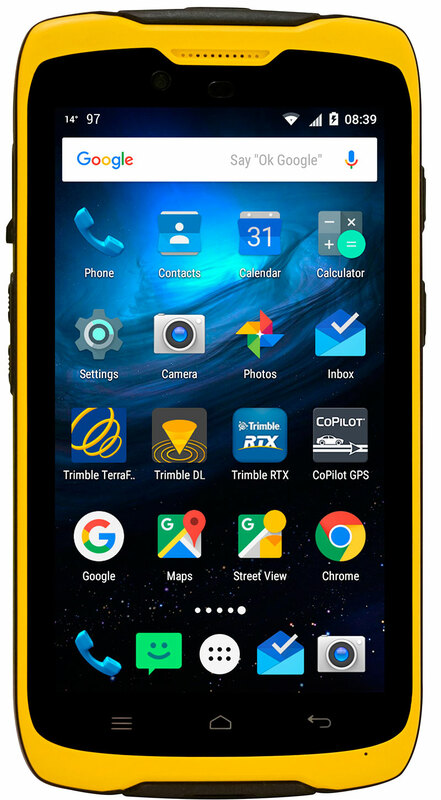 Is it a smartphone or rugged GNSS handheld? Actually, it’s both. The actual available capacity of the internal memory is less than the specified capacity because the operating system and default applications occupy part of the memory. The available capacity may change when you upgrade applications or the device. Bluetooth, wireless LAN and cellular type approvals are country specific. Trimble TDC100 handhelds have Bluetooth, wireless LAN and cellular approval in North America and EU. For other countries, please consult your local Reseller. With Enhanced Capacity Battery. Using wireless technology, such as Bluetooth or wireless LAN will consume additional battery power. Backlight setting at 70% brightness. Results shown at 1 sigma Horizontal Root Mean Squared accuracy. Requires data to be collected using vertical mounting, minimum of 4 satellites, PDOP mask at 99, SNR mask at 12 dBHz, elevation mask at 5 degrees, and reasonable multipath conditions. Ionospheric conditions, multipath signals or obstruction of the sky by buildings or heavy tree canopy may degrade precision by interfering with signal reception. SBAS (Satellite Based Augmentation System). Includes WAAS (Wide Area Augmentation System) available in North America only, EGNOS (European Geostationary Navigation Overlay System) available in Europe only, and MSAS available in Japan only.